As the point of contact with the road you rely on your tyres to perform a number of key roles, from making sure your car can stay on the road to giving you an indication of the car’s overall health. For them to perform these hugely important tasks you need to be sure that they are in good health and safe for road use- doing so will also ensure that you are safe for driving all year round. Wear on your car’s tyre tread patterns can tell you a lot about the health of your car’s suspension components and the alignment of your wheels, but excessive wear at any point on a tyre is reason to have a tyre replaced immediately. Contrary to popular belief, tread patterns on a tyre aren’t simply there to provide more grip; the ridges allow water, mud and other loose surfaces to escape from under the tyres by channelling them in a way that allows the surface of the tread to still make contact with the road. Tyres are designed to wear evenly and excessive wear on a specific area of the tyre can be indicative of an issue with a car’s alignment or core components that left unchecked could wear through the tyre’s tread and in all likeliness do the same for a replacement tyre if fitted too, so it is advisable to carry out any necessary work when replacing the affected tyre to prevent the issue from happening again. Under UK law the legal minimal tread depth for a road vehicle is 1.6mm across the central ¾ of a tyre. As this is a legal requirement, failure to meet this requirement constitutes an MOT failure. Find out more about wheel alignments at ATS Euromaster to make sure you are getting the most from your tyres. For consumers wanting to save money part worn tyres may seem like an attractive offer- you can get the right set of tyres for your car at a discounted price and these days the tyres even need to pass a series of regulations before they can be legally sold. However, part worn tyres still have a number of potential issues, and TyreSafe estimate that 34% of part worn tyres still do not meet the safety levels necessary for everyday road use. Additionally, when you buy a part worn tyre you get no indication of what kind of use the tyres have had previously and no real guarantee that the tyres will last. 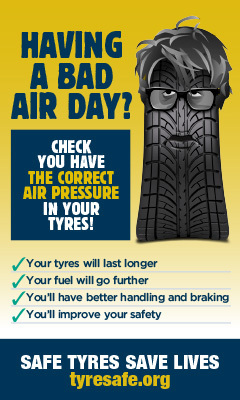 Find out more about the dangers of part worn tyres. Tread wear is only one way to inspect a tyre for visual damage; cracks and bulges in a tyre are another sign that a tyre may not be safe. Bulges in the sidewall of a tyre are often a sign that the internal construction has been compromised- as sometimes happens as a result of damage sustained to the side of a tyre. Cracks in a tyre can happen as a result of the tyre compound hardening either through age or excessive levels of heat and are a telltale sign that a tyre is potentially unsafe. If you do find a crack in your tyre take it along to your nearest ATS centre to have it inspected by one of our qualified technicians. Both tyre bulges and cracks on the surface can be reason for a tyre to fail a car’s MOT. If you drive infrequently and cover very few miles a year, chances are they you will rarely need to change your tyres due to tread wear. However having old tyres fitted to a car can be just as hazardous as driving with worn tyres as rubber compound degrades over time. Although often overlooked, tyres have a date stamp system so you can see just how old they are. You can find this date stamp on the sidewall of a tyre, sometimes preceded by the letters “DOT” along with a series of alphanumerical serial numbers and batch codes. The manufacture date should be a four digit number with the first two digits denoting the week of manufacture and the second two digits signifying the year of production. For example: the code 3616 would mean that the tyre had been created in the 36th week of 2016.